Over the past several weeks I have been migrating my office productivity apps from Microsoft Office to Google Docs. This is part four of the four part series and will cover Google Slides, the presentation application of the Google Docs suite. If you have not read the first three parts of the series, that may be a good place to start if you are interested in making a similar migration yourself. If you are only wanting to learn my thoughts & opinions on Google Sheets, this article will do it for you. With this final part of the series, I will be keeping the same format as I have on the other three parts: Focusing on how Google Slides performs in Chrome, on a Chromebook and on Android devices. As a reminder to everyone who is thinking of making this migration, a word of advice-meets-warning I posted as part of the first article. Rome wasn’t built in a day and your migration to Google Docs won’t happen that fast either. Patience is the word of the day. Of the three apps in the Google Docs suite, Google Slides has probably seen the most growth from a feature & functionality perspective. When it was first launched it was extremely basic. In fact you couldn’t even apply a theme (think template) to your presentation. That has changed and Google Slides has becoming increasingly more powerful with each update over the course of the past two years. All of the functionality you would expect to be in a presentation application is there including the ability to set themes for your presentations, have transitions between slides, animate parts of a slide and import information into slides. You can also add things like links, videos, photos and tables to your presentations. The truth is, much like the rest of the Google Docs suite, there is very little can you cannot do when you compare Google Slides and Microsoft PowerPoint. Equally, one cannot forget perhaps the strongest value of Google Docs as a whole which is the ability to seamlessly and effortlessly collaborate on a document. Google Sheets, like Docs and Slides, allows you to leave comments on slides and collaborate on them. It brings the power of collaboration to users of any skill set and puts the power of your colleagues in the middle of the presentation you are building. 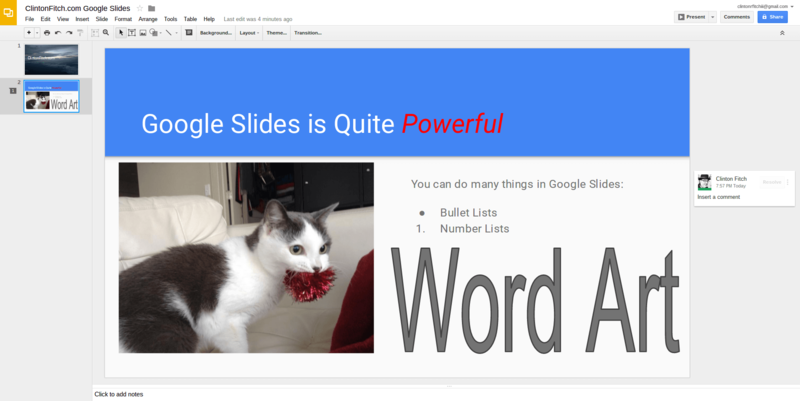 At the risk of being redundant on the other Google Docs apps, Google Slides functions as you would expect. It is snappy in its performance but can stutter a bit if you have several graphic intensive slides (such as slides with photo backgrounds). Like the other apps, the tools bars for Slides is at the top of the Chrome browser which allows you to do all of your text editing, inserting of items into your slides, change themes and the like. For the vast majority of users, everything you will need in a presentation application will be there, it’s just a matter of learning their locations on the menus. Like the other Google Docs apps, Google Slides will allow you to open and edit Microsoft PowerPoint files (assuming you have the Chrome extension installed) so you do not necessarily have to convert files over to Google Slides. That said, you will get more editing power if you do so and the Slides files will synchronize for offline use automatically on your Chromebook and Android devices. platform and not on another platform. If you can do it in Chrome on your PC then you can do it on your Chromebook. The question then comes down to performance. On my Acer C670 Chromebook I have no problem running Google Slides. It’s a little slower than on my Lenovo PC but overall, it’s more than passable and frankly I chalk a lot of it up to the processing power differences between the devices. To start editing a file, I just tap on the Google Slides “app” that is on my Chromebook. That in turn launches the Google Slides site where I can edit the file. The nice thing is that through these apps installed in Chrome OS, I don’t necessarily have to be online. I can edit a document that I have synced to my Chromebook (all Google Docs are sync’d by default) and when I am connected back to the Internet, my changes are automatically synced with my Google Drive account. 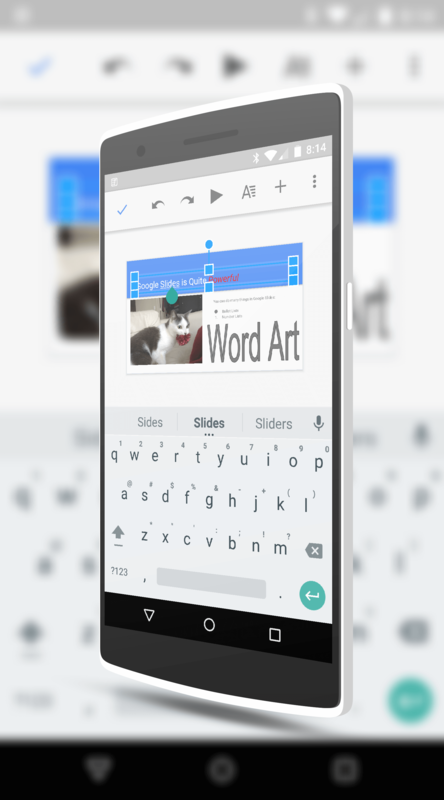 The Google Slides experience on an Android phone or tablet is excellent. All of the functionality and richness you would expect including an extensive list of formulas that can be configured. Indeed, much like the app in Chrome, Google Slides on Android gives you the ability to manipulate the sheets you are working on without any hesitation. The biggest challenge, as with most mobile apps is figuring out where controls for things like fonts, paragraphs and formulas reside in the app. To be fair, it’s a bit easier on a tablet because you have just that much more real estate to work with and the UI adapts to that larger canvas. Overall Google has done a very good job with the Google Docs apps and Google Slides is no exception. It feels complete and functions exceptionally smooth on my various devices (Nexus 7 & OnePlus One being the primary devices these days). Since beginning this migration adventure a month ago, I have reached the conclusion that Google Docs on the whole works for what I need it to do. They all provide a rich range of features and functionality that is similar across all platforms – Chrome on PC, Chromebook and Android. That makes the transition easier as you are not stuck with not having a feature one place where you have it an another. The decision to migrate yourself to Google Docs is one that you need to think long and hard about before doing. You will be frustrated at some point because you can’t figure out something or can’t find a function. Give it time – chances are what you need to do is there and it is just a matter of finding it.